Novak Djokovic eased to his sixth title of 2014 with a comfortable win over Milos Raonic in the final of the Paris Masters. The Serb, 27, prevailed 6-2 6-3 in one hour and 23 minutes. The victory increases Djokovic's lead over Roger Federer at the top of the ATP world rankings. "It's beautiful to win my first match after becoming a father," said Djokovic, whose wife Jelena gave birth to a son last month. "I played my best match of the week. I'm very happy to have the opportunity to stand here with the trophy." The world number one has now reached 600 career wins - a feat achieved by only four other active players. He has won 20 Masters titles, while Wimbledon semi-finalist Raonic's wait for a breakthrough success at this level continues. The Canadian doubled his tally of wins over top-five players in reaching the final, beating Roger Federer and Tomas Berdych. But he was on the back foot from the start against Djokovic, dropping his opening service game with a poor netted volley. The Serb saved three break points before breaking Raonic again to clinch the first set. 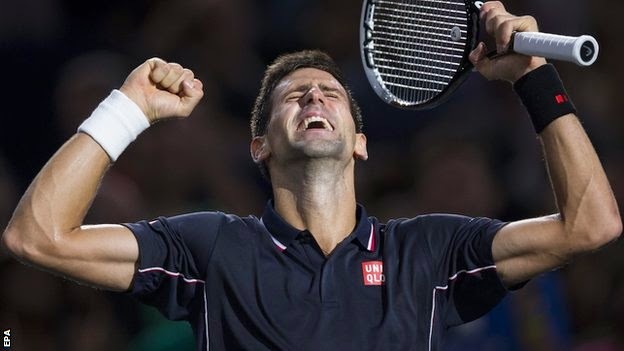 Another break early in the second set was enough for Djokovic to extend his winning streak in indoor matches to 27, ahead of the ATP Tour Finals at London's O2 arena next week.